After 70 years of Israeli colonization of Palestine and discrimination against the Palestinians treating them as subhuman goyims, Israelis; the racist self-proclaimed holy people, light on all nations, have just crowned their racist ideology with a new law; Jewish Nation-State Law, that was passed on July 19th. This law defines the Zionist Israeli colony in Palestine as a state that belongs exclusively to the “Jewish people”. 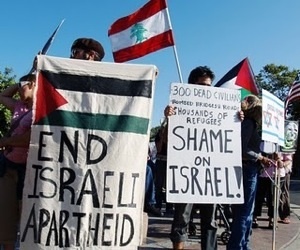 It totally disregards and cancels the citizenship of the indigenous Palestinians numbering more than 50% of all the recent population and whose roots in the land go back thousands of years in history even before the alleged existence of ancient Israel. In short, this law is a flagrant discrimination against Palestinians. This Jewish discrimination has a long history that started 100 years ago and gradually grew in intensity until it culminated with this Jewish National-State Law. Israel does not allow Palestinians to buy or rent any land because the Israeli government claims the whole Palestine as Jewish owned granted by divine land deed. Palestinian towns are considered contaminants on sacred Jewish land that need to be extricated. Thus, Israeli governments pursued a policy of graduated demolition of Palestinian homes and villages. The recent demolition of Palestinian Khan el-Ahmar village last week is the latest example. Palestinian existence is tolerated as long as they are perceived as slaves; animal souls born in human bodies whose sole existence is to serve the god’s chosen people; the Jews. Israel has finally admitted what all the world has known since the beginning of its illegal colonial establishment as the ultimate racist apartheid in the whole world. Israel is a colonial project based fundamentally on the racist religious faith of Judaism with a genocidal real estate racist god, who favors one alleged nation over the rest of his creations to be the light on nations and assigns them a promised piece of land as a homeland. Let us remember that Judaism is a religion not a nationality, and that “Jewish people” is just a religious farce, for modern Jews came from different nationalities, and Israeli Jews are Jews, who adopted the Zionist colonial ideology. This law openly declares that Israel is an apartheid regime that is worse even than the old South African apartheid regime. It clearly exposes the fallacy that Israel is the “only democracy” in the Middle East for in actuality Israel has been the only racist and Jewish exclusive state in the Middle East. The region does have some Arab democratic regimes such as that of Lebanon, Syria, Iraq, and Egypt where government is elected in as a democratic fashion as the American elections. Unlike Israel that considers itself Jewish only, these Arab countries have citizens who are members of different religions and creeds and are from different ethnicities. This Israeli law embodies the ugliest form of racism far worse than the Nazi’s motto of “Deutchland über alles” (Germany above all). Racism is the most fundamental building block of Zionism/Israel and is an intrinsic characteristic of the Zionist colony so much so that Zionist Jews do not just discriminate against all goyims; non-Jews, but they also discriminate against different factions of Jews among themselves, and segregate each faction from the others; Ashkenazim, Haredim, Sephardim, Mizrahim, and black African Jews, Oriental Jews, Russian Jews European and American Jews. This intra-racism is so strong that white Jewish Israelis regularly commit hate crimes against black Ethiopian Jewish Israelis and refuse to have them live in the same neighborhood or shop in the same grocery stores, or work in the same office, or even buried in the same grave yards. This racism is implanted early in the minds of their children in public schools, where black Jewish Israeli children are segregated from white Jewish Israeli children. This racism and segregation breed hatred and violence that is encouraged in the Israeli educational system since kindergarten classes. Students are taught that the Jewish race is a special race, a holy race, light upon all nations; god’s chosen people, while the Others are defiled races. It is still not clear to many nations and their political leaders that the ultimate goal of this Greater Israel Project is not just to colonize and control only Palestine, but also the whole Middle Eastern region as its second phase.